Daniel Bohnhorst was born and raised in Minneapolis, Minnesota. He has earned degrees in history and violin repair, as well as an MFA in Writing from Pacific University. His poems have recently appeared in Rattle and Best New Poets 2014. His translations from the Spanish appear in the anthologies Theatre Under My Skin (Kalina, 2014) and Low Down and Coming On (Red Dragonfly, 2010). He lives in Santa Fe, New Mexico, where he works in the violin shop. Geosi Gyasi: You won first place in the SFR 2011 Writing contest for your poem “The Boundary Waters”? Tell us a bit about that story? Daniel Bohnhorst: The poem refers to the Boundary Waters Canoe Area, a protected wilderness that lies on the border of Canada and the United States (Minnesota) and is accessible only by canoe. I have been on many canoe trips into this area, and on one trip I had a succession of strange and violent dreams, spurred on by who knows what, maybe bad weather and hard paddling. In any case, the dreams shook me, especially coming in such a peaceful place as the Boundary Waters can often be, and so this poem came about. Geosi Gyasi: What inspired your poem, “Lying Awake at Valles Caldera”? Daniel Bohnhorst: Valles Caldera is a dormant volcano in the northern part of the state of New Mexico. I visited there one autumn, and was struck by the beauty of the grasslands in the valley, and how the valley seemed to cradle the harvest moon in late daylight. I suppose this poem shares something with “The Boundary Waters” in its juxtaposition of felt serenity and possible or imagined violence. In any case, I began to imagine the lava beneath these grasslands, and the poem, especially the last stanza, came as a sort of gift. Geosi Gyasi: Do you have regular hours when you write? Daniel Bohnhorst: I don’t write every day, but it’s usually in the morning when I do, before the great Critic in me has woken up. The raw stuff comes in the morning always, and then the editing comes later at any time. Geosi Gyasi: Did you know as a child that you would become a writer? Daniel Bohnhorst: I loved to write as a child, little stories, and I used to type nonsense stories on an old typewriter before I could really read. But no, I never thought I would become a Writer. I was always reading, and both my parents are great readers. I fell in love with poetry around 2006, started gobbling up poetry books insatiably, but only began writing my own work with any seriousness a few years ago. Geosi Gyasi: Besides writing, what else do you do? 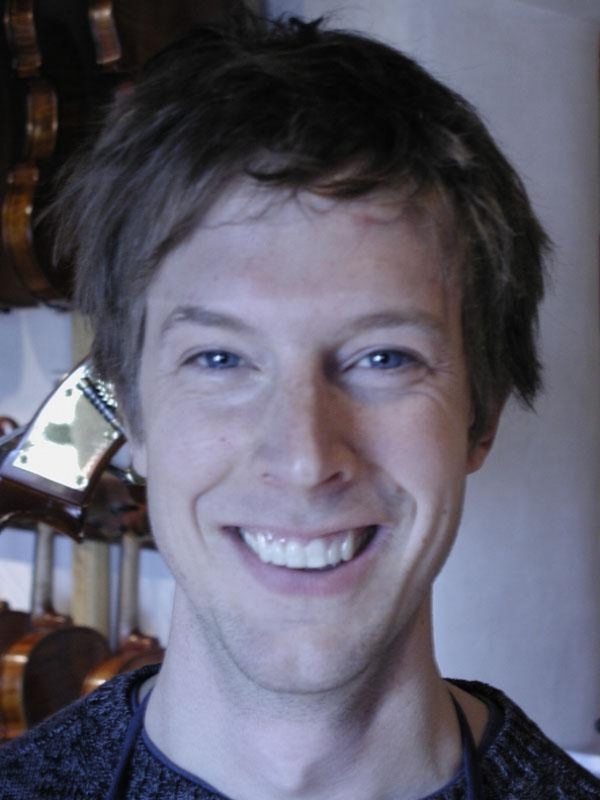 Daniel Bohnhorst: I am trained in violin repair, and I work in the violin shop in Santa Fe, New Mexico, where we rent, sell, and repair stringed instruments. I love listening to all sorts of music, and occasionally playing a little myself. I am currently arranging a bilingual theatrical presentation of the poetry of Neruda and Whitman, which will open at Teatro Paraguas, a Santa Fe theater, in March. Geosi Gyasi: How do you write – notebooks or computer? Daniel Bohnhorst: Both: I go back and forth. Sometimes the notebook writing gets too precious and I have to go to the computer. Sometimes the computer writing gets too casual and I have to go back to the notebook. I just feel it out as I go. Geosi Gyasi: Are you a compulsive reader? Daniel Bohnhorst: Yes. Is there any choice? The idea that one can write seriously without reading seriously is ridiculous, and the separation of the creative writing and literature departments in universities has been toxic to literary culture everywhere. I’m only parroting Donald Hall here, but it’s still true. You have to read compulsively, re-read the books that feed you the most, read the greats even if you disagree with them, etc. Geosi Gyasi: Do have a personal ritual you engage in while you write? Daniel Bohnhorst: Not really. Sometimes outside in silence in a notebook like a good pious poet, sometimes inside with music loud in my headphones and typing frenetically and goofily on my laptop: it all depends on how I’m feeling and what kind of poem I’m going for or what the process needs right then. Whatever works. Geosi Gyasi: Which of your work(s) do you consider most important? Geosi Gyasi: Have you ever struggled writing a sentence or paragraph? Daniel Bohnhorst: Always, all the time. Getting the rhythm and music and feeling and meaning all right in a phrase, a sentence, not to mention an entire poem, is a constant battle. Sometimes it comes easily, but very rarely for me. Geosi Gyasi: Which writers have had great impact on your writing? Daniel Bohnhorst: Any list will be inadequate, but here are a few. Geosi Gyasi: Which books feature most on your shelves? Daniel Bohnhorst: Poetry books. Many many poetry books everywhere. Geosi Gyasi: Do you get any joy out of writing? Daniel Bohnhorst: Certainly. I would not keep doing it otherwise. Geosi Gyasi: You are part of best 50 poets selected by Dorianne Laux for Best New Poets 2014. I am wondering if you could give us a gist of what “In Aleppo” is all about? Daniel Bohnhorst: “In Aleppo” is a poem I wrote after watching a Frontline documentary about civilian life in the city of Aleppo during the ongoing Syrian Civil War. I was moved by the story of two little girls who were out looking for toys in the middle of a war zone, so I wrote a poem trying to celebrate this persistant search for joy in such a dangerous and hellish atmosphere. Geosi Gyasi: What’s your worst moment as a writer? Daniel Bohnhorst: Whenever I begin to write from a place of pretense or false emotion. Or when I become jealous or despair over lack of publication and recognition, and lose sight of the truer goal, of the heart’s imagination, of the inherent health I get from reading and writing when I am listening deeply and tuning out the noise of literary gossip. Geosi Gyasi: Do you have particular theme(s) you often write on? Daniel Bohnhorst: Solitude, I suppose. I’ve lived a quiet life among quiet people for the most part. The possibility of sharing solitude, of gaining courage from each other’s solitary experience. Geosi Gyasi: What are your aspirations in the foreseeable future? Daniel Bohnhorst: Keep on keeping on. This entry was posted on Wednesday, November 5th, 2014 at 8:47 pm and is filed under Uncategorized. You can follow any responses to this entry through the RSS 2.0 feed. You can leave a response, or trackback from your own site.